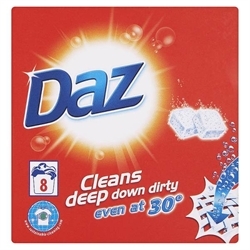 Daz is the name of a popular laundry detergent on the market in the United Kingdom and Ireland. It is manufactured by Procter & Gamble and is lower priced than P&G’s main brand, Ariel. Aggressively marketed, it is associated in popular culture with the “Daz Doorstep Challenge” series of commercials, which saw various ‘hosts’ including Danny Baker, Shane Richie and Michael Barrymore surprising house occupiers at the door and asking them to put Daz to the test against a rival detergent.